Barnabas Christian Academy School in Port St. Lucie is facing eviction and had its CEO resign just days ago. PORT ST. LUCIE, Fla. — Dozens of parents and some teachers at Barnabas Christian Academy in Port St. Lucie met for the first time Monday night with the new CEO for the school, Kimberly Baumgardner. The former CEO of the school, Michael Woodbury, resigned late last week. Meanwhile, the Barnabas Christian Academy, formerly known as The Nation Christian Academy, is facing eviction. Parents and teachers were looking for more answers on what is next for the school. Some parents said they left with just as many questions as they showed up with. Baumgardner said she did her best to assure them she is working hard to make sure students are the priority in any upcoming decisions. It has been a tough few months for the school. In October, the then-CEO Woodbury was recorded going on a profanity-laden rant against a student. “I don’t give a ****. I control transcripts. I control where you go next. It could be back to Haiti…” Woodbury said, in part, during the rant. This prompted some parents to pull their students out of school. Earlier this month, the school was given an eviction notice by its landlord, according to school leadership. School staff confirmed they are behind in about $40,000 worth of rent payments. But, they also feel the landlord is pushing them out. Baumgartner is also the Executive Director for the St. Lucie Christian School. A merger of the two schools could be possible in the future, but there was also discussion Monday of keeping the schools separate, even if they end up sharing a building. The other option to explore is whether the lease payment issues could be resolved and Barnabas could stay in their location. Monday, Baumgartner indicated it seems most likely students at Barnabas would eventually be transferred to the St. Lucie Christian location in Fort Pierce. “We really are just working together to come up with a solution that’s going to work for all parties involved,” Baumgardner said. Parents also said they want to be sure their students can keep their teachers, and wanted to know if St. Lucie Christian would offer the same classes. 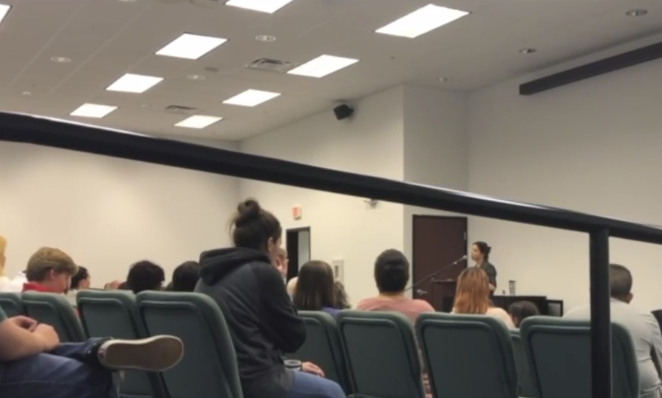 “I didn’t choose to be in front of this parents this soon, but I didn’t mind stepping up and answering the questions I could because I think it’s pretty important for parents to hear direct things that are being done,” Baumgardner said. Baumgardner was not able to answer a lot of questions, as all of this is new for her, too. “I think just given what Barnabas has been through lately, I think some tough questions were needed and I didn’t mind answering them to the best of my ability, but now I have some research to go do,” Baumgardner said. For parents concerned about getting their children to Fort Pierce if the school transfers to St. Lucie Christian, Baumgardner said bus service could be provided. Baumgardner is also inviting parents and students to set up a tour of St. Lucie Christian in the chance students do end up there at some point during this school year.